When you talk about the all-time greats, Khan is often the first name that comes to mind, but who beat JK in 1981 in the British Open? Who had 8 British Open titles, when 8 was the most ever? Yup it was Geoff. “About No.4” he said casually. “You wouldn’t be Stewart Boswell would you?” he was! Just then another Aussie coach in their party said something to our new mate and a minute later Stewart relayed the news to me that ‘Geoff’ had just told him that Australia had lost their last wicket and so also lost the 1st Test Match by just 14 runs. Well there was nothing more for it except for Matt to get a photo with Stewart and me to get a photo with the Geoff – errr sorry that’s Mr Hunt – MBE – squash legend! (born 11 March 1947, in Melbourne, Australia), is a retired Australian squash player who is widely considered to be one of the greatest squash players in history. 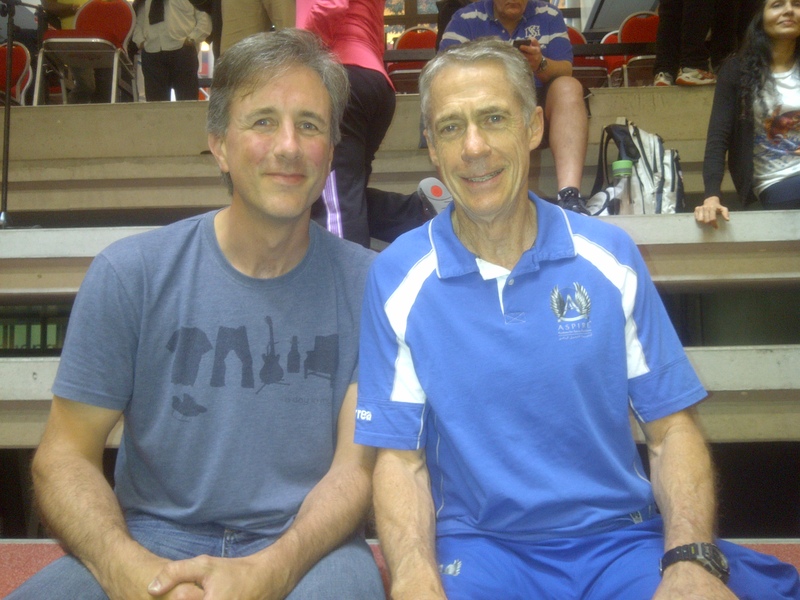 He was ranked the World No.1 squash player from 1975 to 1980. He won the World Open title four times. He was the event’s inaugural champion, winning the competition on the first four occasions it was held (1976, 1977, 1979 and 1980). He also won the International Amateur Individual Championship three times (1967, 1969, and 1971), and the British Open (which was considered to be the effective world championship event involving both amateurs and professionals before the World Open began) eight times between 1969 and 1981. Hunt won 178 of the 215 tournaments he contested during his career. He also won the Australian Junior Championship in 1963, and he first won the Australian Amateur Men’s Championship in 1965. Hunt was known for having great determination. He ultimately suffered back problems, which curtailed his career. After retiring as a player, Hunt served as the Head Squash Coach at the Australian Institute of Sport from 1985–2003, where he helped develop a new generation of Australian squash stars. Hunt has been inducted into the World Squash Federation Hall of Fame and the Sport Australia Hall of Fame. In 2003, Boswell had been ranked in the world’s top-10 for two years and had reached a career-high ranking of World No. 4, when a mystery back ailment forced him to stop playing. He returned to the professional tour in 2005. On his return, he won six of the tour’s lower-ranking tournaments in a row, and two further lower-ranking tournaments later in the year. He broke back into the world’s top-20 in 2006 and the top-10 in 2007. At the Commonwealth Games in 2002, Boswell won a Bronze Medal in the men’s singles, and Silver Medal in the men’s doubles partnering Anthony Ricketts. Boswell and Ricketts again won a men’s doubles Silver Medal at the 2006 Commonwealth Games. The pair won the men’s doubles title at the 2006 World Doubles Squash Championships. After losing out to Gregory Gaultier during the 2011 Kuwait PSA Cup, Boswell announced he would retire from professional play. He (GH) still looks fitter than a butcher’s dog! What about (JB)? Does he not look fitter than a butcher’s dog?